Ever hear two bread bakers talk about sourdough? The thing is, only intermediate to advanced bakers talk like that which is fine and everything, but really confusing to the beginner baker. You can bake perfectly good bread without memorizing every bread term in a sourdough baking glossary. But, because I know you’ll fall down the rabbit hole eventually (I totally did), here are 12 hand-selected terms that I feel you will benefit from. A live fermented culture of flour and water. A portion is used to make bread dough rise- no commercial yeast is required. You can make a sourdough starter from scratch or purchase one here. This is an offshoot of your sourdough starter. For example, if you take a portion of your starter (made with all purpose flour), and mix it in a separate bowl with with rye flour, you’ve now created a levain. The goal of a levain is to build specific flavor profiles, with different types of flour, without changing the original makeup of the sourdough starter itself. People use the term “sourdough starter” and “levain” interchangeably which is confusing. Now, you know the difference. Also known as the “first rest,” this term refers to the resting stage right after the dough has been mixed. So, imagine this: after you combine the dough, mix it into a shaggy ball, and let it rest for 30 minutes…. that’s autolyse. This resting stage can range anywhere from 15 minutes up to 4 hours or more, depending on the recipe and the baker’s preference. I love a good, long autolyse when time permits. The benefit is to jumpstart gluten development without kneading. It makes the dough much easier to handle, too. Just feel it after 30 minutes vs. the 1 hour mark. The longer the rest, the softer and more manageable the dough will be. Sourdough needs to rise twice. The bulk rise, also known as the “first rise” or “bulk fermentation” is where the majority of the gluten development takes place. This is a crucial step in sourdough baking. Strong gluten is needed for proper structure and overall height. The bulk rise can take anywhere from 4 -12+ hours or more, depending on temperature. Either way, rush the bulk rise and you’ll end of with a brick. During the bulk rise, you have the choice to stretch and fold the dough. This is a technique that gently aerates the dough without squashing out all the beautiful bubbles into oblivion. Some call it kneading, but I wouldn’t go that far- it’s minimal at best. Incorporating this technique will increase the overall volume of your bread giving it a plump, artisan look when done correctly and properly shaped. Remember what I said earlier? Sourdough needs to rise twice? This is it. Also known as the “final proof” or “final rise” here, the shaped dough rises for the very last time. The duration is no where near as long as the bulk rise; you’re looking at 30 minutes and up to 2 hours at room temperature, or alternatively, overnight in the fridge. The dough is ready when it puffs up and no longer looks dense. PS- when left unlined and heavily floured, they create pretty coiled patterns on the surface of baked bread. A cut or slash made in the dough prior to baking. This technique is both functional and decorative. It allows the steam to escape and controls the direction in which the loaf opens up. Your design can be as simple or artistic as you’d like. Pronounced “lahm,” a bread lame is a tool that bakers use to score the dough. It’s essentially a razor blade attached to a long handle. Do you need a bread lame as a beginner? No, using a small serrated steak knife or even just a solo razor blade is fine. But eventually, bread lames are fun to play around with. You’ll see. It will make you feel professional. This refers to the increase in size of the bread during baking. Plump, lofty loaves have great oven spring whereas dense, flat loaves lack oven spring. This is the interior cross section of the bread. Imagine cutting a slice of sourdough and inspecting the inside texture… does it have big holes? Small holes? Is it dry? Damp? This is what bakers call the “crumb” (not to be confused with the mess on the floor if you don’t eat over a plate). Hydration is the ratio of water to flour in bread dough. It’s often expressed as a baker’s percentage. For example, a recipe with 300 g of water and 500 g would be 60% hydration (300/500). 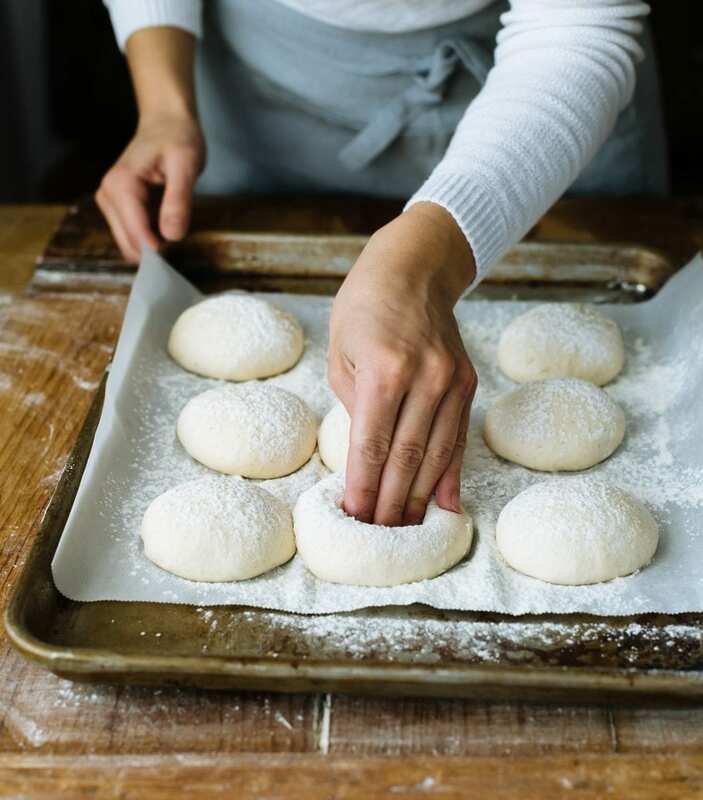 Low hydration doughs, which are dry and somewhat stiff in texture, fall in the 55-65% range; 70% and up are considered high hydration doughs, which are wet and a little more difficult to handle. Hydration can be applied to sourdough starters, too. A starter fed with equal parts flour and water by weight is defined as 100% hydration. Characterized by a thickish batter-like texture, it is the most common starter that bakers use. Ready to bake sourdough bread? Click here for my Beginner’s Guide. *This post contains affiliate links. Thanks for the support friends!